In the works for many months, the Sebring 2013 event saw the finished installation of the Lycoming AEIO-233 aerobatic-capable powerplant installed on the nose of the FK12 Comet (which itself can handle up to 9 Gs of positive loading). 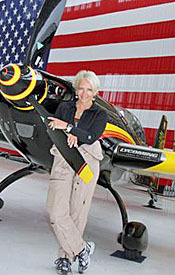 Aerobatic legend Patty Wagstaff is considering doing a routine in a Light-Sport Aircraft and it could be this one after a period of suitable trials. Watch this video and learn more about the project. MINI REVIEW -- In what we expect to be the first of many more, we offer our first mini review of an aircraft. Longer reviews are available here on ByDanJohnson.com ...just click on the link above any video still image to see what content is available. Plus, we'll add more full-length video reports over time. Meanwhile, enjoy this short take on the much-admired Fk12 Comet biplane with aerobatic potential. MINI REVIEW — In what we expect to be the first of many more, we offer our first mini review of an aircraft. Longer reviews are available here on ByDanJohnson.com …just click on the link above any video still image to see what content is available. Plus, we’ll add more full-length video reports over time. Meanwhile, enjoy this short take on the much-admired Fk12 Comet biplane with aerobatic potential. FK Lightplanes is known to Americans for its foldable high wing, the FK9. Now the German company and its importer Hansen Air Group is offering their unique folding biplane, the FK12 Comet. Popular in Europe for years, the FK12 offers aerobatic flying capability... but only after the Lycoming O-233 engine is installed. Catch the details on this video. FK Lightplanes is known to Americans for its foldable high wing, the FK9. Now the German company and its importer Hansen Air Group is offering their unique folding biplane, the FK12 Comet. Popular in Europe for years, the FK12 offers aerobatic flying capability… but only after the Lycoming O-233 engine is installed. Catch the details on this video. Germany's Fk Lightplanes is an unusually versatile supplier of Light-Sport Aircraft. This well established producer has a high wing (the Fk9), a low wing (the Fk14, with another one in development) and a biplane. The latter, called the Fk12 Comet is the focus of this video and the model has just landed on American shores. Get updated on the plans of importer Hansen Air Group as we speak with Mitch Hansen about a biplane available in various configurations. Germany’s Fk Lightplanes is an unusually versatile supplier of Light-Sport Aircraft. This well established producer has a high wing (the Fk9), a low wing (the Fk14, with another one in development) and a biplane. The latter, called the Fk12 Comet is the focus of this video and the model has just landed on American shores. Get updated on the plans of importer Hansen Air Group as we speak with Mitch Hansen about a biplane available in various configurations. The FK Lightplanes company has released its new Fk9 ELA that more closely meets U.S. LSA regulations but its Mark IV version of the Fk9 is one of Germany's most popular light aircraft. See it in this video atop straight Baumann floats made in Minnesota. The FK Lightplanes company has released its new Fk9 ELA that more closely meets U.S. LSA regulations but its Mark IV version of the Fk9 is one of Germany’s most popular light aircraft. See it in this video atop straight Baumann floats made in Minnesota. Comet Number 100 takes to the air. 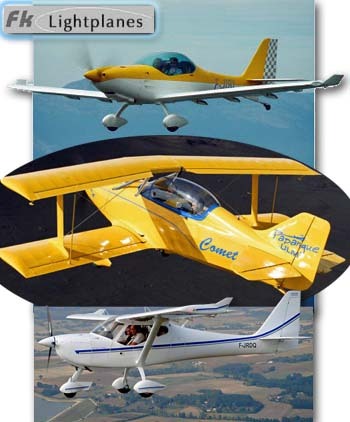 Comet is the only biplane among Light-Sport Aircraft. How's this for your minimalist trailer? 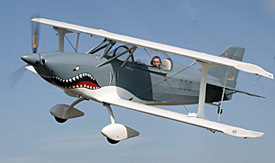 Peter Funk is a prolific designer of a high wing, low wing, and biplane. He created a sensation at Aero 2011 with this Lemans version of his Fk14. Fk Lightplanes in Germany celebrated the production of Number 100 of their fascinating model the Fk12 Comet. This snappy handling, steady flying, folding wing biplane has no competitors in the LSA space, even with 123 total models winning Special LSA approval. At airshows here in America, Hansen Air Group has been showing the Comet to substantial interest. It has enough going for it that we've made several videos about it (at AirVenture 2011 and earlier at at Sebring 2011) plus a video mini pilot report. *** German designer Peter Funk (photo) — who I've known for many years — counts himself among those pilots who have a soft spot for biplanes. This interest stimulated the prolific designer to create a lightweight biplane way back in 1994. He said his intention was to build not only a plane preserving the classical style of a biplane but that would also provide good flight performance and be easily and comfortably folded up for hangar storage. Funk also wanted to be able to fly in winter so he envisioned a fully enclosed biplane though options provide for an open cockpit version for those of us who like some air in our hair. Comet entered production at the end of 1997 and today is one of the most widely sold biplanes in Europe. *** Peter said, "Comet is also most likely the only biplane in the world that has a laminar profile and it is most certainly the fastest of its kind." Fk12's sprightly performance and crisp handling lends it to aerobatic flying along with other design attributes. Its flight qualities and strong airframe (+9 -3 G) are leading to the installation of a Lycoming O-233* to allow fully aerobatic maneuvers. Rotax powers most Comets but the Austrian engine manufacturer does not permit their engine to be used in aerobatic flight. Peter clarified, "Comet's airframe has shown compliance to FAR Part 23 acrobatic regulations and so can be used for basic acro." He added that the Comet can accommodate larger engines up to 130 hp. The Lycoming is usually stated at 118 horsepower. *** "We don't say Comet is something to compete with Pitts or Extra," said Peter, "but it's remarkable that even with the standard 100-hp Rotax 912 you have the same power-to-weight ratio at aerobatic gross weight to compare with a 180-hp Pitts or an Extra 200." 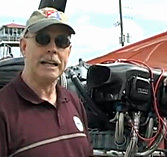 Peter noted, "At present we are preparing a Lycoming installation for the U.S. market that we will show at Sun 'n fun 2012," he said. Look for it at the Hansen Air Group display. *** "Remarkable details include the 'five minute folding wing' system, the full laminar wing section, and the opportunity to fly it open cockpit or closed canopy. Converting the cockpit configuration takes only a few minutes." So, if you've been daydreaming about getting upside down in your Light-Sport Aircraft, you may not have to wait much longer. * The Lycoming installation will soon commence at Renegade Light Sport, builder of the low wing, all-composite Renegade. The latter is supplied with the O-233 and the Missouri company's knowledge about installing the Lycoming has attracted other companies to their new facility. Fk Lightplanes in Germany celebrated the production of Number 100 of their fascinating model the Fk12 Comet. This snappy handling, steady flying, folding wing biplane has no competitors in the LSA space, even with 123 total models winning Special LSA approval. At airshows here in America, Hansen Air Group has been showing the Comet to substantial interest. It has enough going for it that we’ve made several videos about it (at AirVenture 2011 and earlier at at Sebring 2011) plus a video mini pilot report. *** German designer Peter Funk (photo) — who I’ve known for many years — counts himself among those pilots who have a soft spot for biplanes. This interest stimulated the prolific designer to create a lightweight biplane way back in 1994. He said his intention was to build not only a plane preserving the classical style of a biplane but that would also provide good flight performance and be easily and comfortably folded up for hangar storage. As they've done numerous times, Hansen Air Group — a team of dedicated pilots, nearly all of whom fly or formerly flew airliners for their day job — has helped shepherd another Light-Sport Aircraft through the ASTM standards process to get a FAA airworthiness certificate. The Altanta area importer has done this with several aircraft including some Tecnam models, Sky Arrow, and Peregrine. In recent months, Hansen took over U.S. import duties for FK Lightplanes, which has facilities in Germany and Poland. *** Welcome to SLSA #123, the dashing FK12 Comet biplane. FK12 is the first-ever biplane to win SLSA approval, the second qualified LSA for FK Lightplanes, and the second LSA type to arrive in the USA for aerobatic flight (the first was the Snap from SportairUSA). FK12 made a first official U.S. appearance in the LSA Mall at AirVenture 2011 (as did Snap). Crowds frequently gathered around Comet, thoroughly stomping down the grass all around the airplane. Unveiled this summer with the Rotax 912, Hansen Air Group is working with Renegade Aircraft to install a Lycoming AIO-233. Rotax does not permit aerobatics with their engines — manufacturers have full authority over such use under LSA rules — but Lycoming does permit unusual-attitude flying. Given the Hansen team's high level of pilot skills, aerobatic flying is of great interest. *** Biplanes are often used for aerobatics as their short spans and high roll rates are useful for that sort of maneuvering. Hansen brothers Mike and Mitch report measuring FK12's roll rate at 1.07 seconds for a 60-to-60 roll reversal. (If you don't know these numbers, that's fast.) Comet's 22-foot span and four full-span flaperons account for the zippy handling. I can report from my own experience (my pilot report will soon appear in Light Sport and Ultralight Flying) that FK12 Comet may be blazing fast in roll but is a very docile cruiser, holding straight and level with minimal input. *** FK Lightplanes, headquartered in Speyer, Germany but with their own production facilities in Poland, is well regarded for its handsome designs. Also prolific, FK Lightplanes often shows distinction in the shapes and details of their airplanes. This year at Aero, the big show in southern Germany each April, FK Lightplanes captured visitors with their exquisite LeMans version of their low wing Polaris FK14 (the same model selected by Cirrus Design as their LSA entry, the SRS| which project, regretfully, was shelved.) Though more basic, the new FK9 ELA is a highly evolved folding wing monoplane available in taildragger, tricycle gear, and floats. Polaris/LeMans is also available as a taildragger or on tricycle gear. 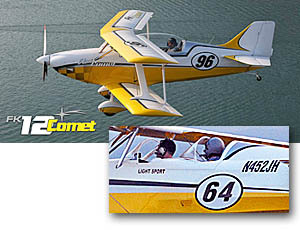 FK12 Comet is only available as a taildragger but with three cockpit configurations. As they’ve done numerous times, Hansen Air Group — a team of dedicated pilots, nearly all of whom fly or formerly flew airliners for their day job — has helped shepherd another Light-Sport Aircraft through the ASTM standards process to get a FAA airworthiness certificate. The Altanta area importer has done this with several aircraft including some Tecnam models, Sky Arrow, and Peregrine. In recent months, Hansen took over U.S. import duties for FK Lightplanes, which has facilities in Germany and Poland. *** Welcome to SLSA #123, the dashing FK12 Comet biplane. FK12 is the first-ever biplane to win SLSA approval, the second qualified LSA for FK Lightplanes, and the second LSA type to arrive in the USA for aerobatic flight (the first was the Snap from SportairUSA). FK12 made a first official U.S. appearance in the LSA Mall at AirVenture 2011 (as did Snap). Designer Peter Funk poses beside his attention-getting Fk14 Lemans. Each occupant has his/her own windsreen; entry is made easy as the entire arrangement hinges open. Reporter Marino Boric and designer Aki Suokas (right) discuss the details of the unusual and fascinating FlyNano "boxwing." The major European Airshow, Aero, opened this morning with the usual unveiling of new designs but one aircraft appeared to be the center of attention. Peter Funk had an idea five years back but shelved it for other projects. Now the time is right for his distinctly retro treatment of one of Light-Sport aviation's sharpest designs, the Fk14 Polaris (Alert readers will identify Polaris as the Cirrus SRS, that GA company's onetime entry in the LSA sweepstakes.) *** Even experts accustomed to following the latest in new or updated designs were caught off guard by the unorthodox entry (photo). With dual windscreens and race car bodywork, the open cockpit creation charmed many who gained early access to the great exhibit halls of Aero... 11 of them, each the size of a gymnasium. While exhibitors were assembling their displays Fk Lightplanes' staff grabbed lots of attention with their Fk14 Lemans. *** Constrained by their ongoing contract with Cirrus until the end of the year, Fk Lightplanes sought permission before revealing Lemans and sales will not happen in 2011. Yet Lemans will be a show hit for Fk — it already was, actually, even before Aero opened. 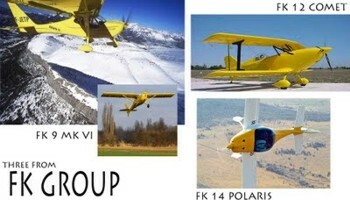 Get more info on Fk Lightplanes. ||||| Another fascinating project is the FlyNano "Boxwing." Created in Finland by Aki Suokas FlyNano has several distinctive features... besides the connected lower lifting wing and upper stabilizing surface. From a weight standpoint, the tiny carbon fiber aircraft could easily fit America's Part 103 category at a mere 70 kilos (154 pounds) empty. So even powered by the British Bailey four-stroke engine, which the designer thought had sufficient power, FlyNano handily fits Part 103's slim weight limit. And FlyNano is a seaplane, using a hull as its main lower fuselage component. It hasn't flown yet but is ready "as soon as our lakes unfreeze." Get more info on FlyNano. 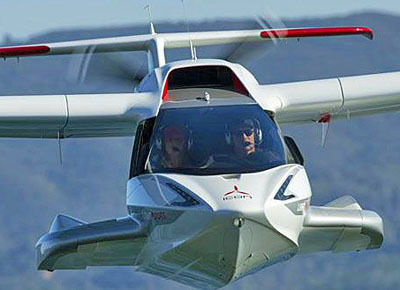 ||||| The other major development for Light-Sport at Aero 2011 are several new entries in larger airplane classes. Tecnam started this trend with the twin engine four seater they type certified last year, now greatly topping that by revealing an 11-seat regional commuter aircraft. The company also has a new Lycoming O-233-powered Eaglet LSA plus a four seater amid their huge airshow display. More on these after their press conference. Flight Design unveiled their four seat C4 via a full-sized mockup. The new GA candidate looks like a very grown-up CTLS, arguably the most handsome iteration yet of their best-selling CT series. 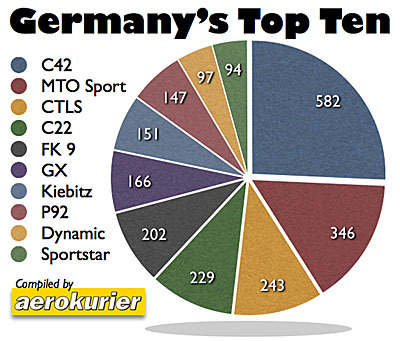 Pipistrel has a four seater... and... well, Aero has lots more. Return soon to see and read about many fascinating entries at Aero 2011, where more new airplanes are introduced than any other show I attend. The major European Airshow, Aero, opened this morning with the usual unveiling of new designs but one aircraft appeared to be the center of attention. Peter Funk had an idea five years back but shelved it for other projects. Now the time is right for his distinctly retro treatment of one of Light-Sport aviation’s sharpest designs, the Fk14 Polaris (Alert readers will identify Polaris as the Cirrus SRS, that GA company’s onetime entry in the LSA sweepstakes.) *** Even experts accustomed to following the latest in new or updated designs were caught off guard by the unorthodox entry (photo). With dual windscreens and race car bodywork, the open cockpit creation charmed many who gained early access to the great exhibit halls of Aero… 11 of them, each the size of a gymnasium. 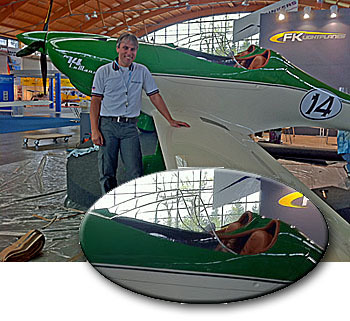 While exhibitors were assembling their displays Fk Lightplanes’ staff grabbed lots of attention with their Fk14 Lemans. *** Constrained by their ongoing contract with Cirrus until the end of the year, Fk Lightplanes sought permission before revealing Lemans and sales will not happen in 2011. Duplicating their pattern at EAA AirVenture, Sun 'n Fun, and AOPA's Expo, Cirrus stepped up with sponsorship money in addition to buying space. Their assistance along with other sponsors helps Sebring Airport Authority put on this industry event. 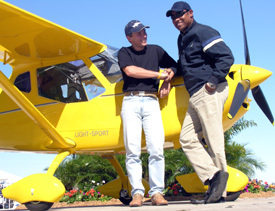 Over January 17-20, 2008 every significant company in Light-Sport Aircraft will be in Sebring, Florida. The Sebring Expo preludes with an ASTM meeting. During the event LAMA hosts its annual member meeting and dinner plus its board will meet. EAA will organize a slate of info forums. Importantly, vendors can deliver demo flights all day every day. *** Event Chairman Bob Wood reported, "Cirrus Design is the most recent addition to the stellar group of companies now sponsoring the event. 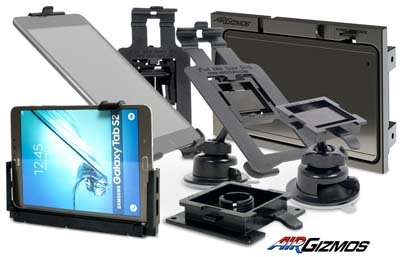 They join Cessna, Garmin, The Southern Ford Dealers, and others." *** Sebring #4 appears bound for new records. Paid exhibit space available increased again in 2008. "We are up nearly 30% in spaces over 2007, and now nearly every one of those is booked," said Wood. Most of the 47 companies and the 59 models that have achieved SLSA status can be found at Sebring making it the largest collection of LSA anywhere. What a way to start your year. But act now! Motel space is reported already in short supply with three months to go. 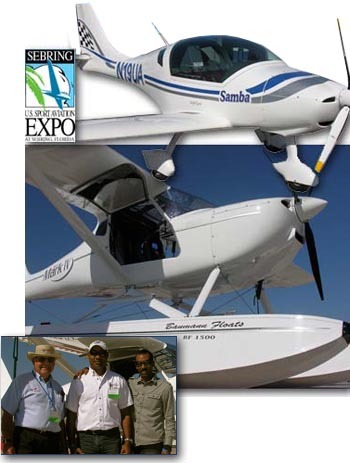 Over January 17-20, 2008 every significant company in Light-Sport Aircraft will be in Sebring, Florida. The Sebring Expo preludes with an ASTM meeting. During the event LAMA hosts its annual member meeting and dinner plus its board will meet. EAA will organize a slate of info forums. Importantly, vendors can deliver demo flights all day every day. *** Event Chairman Bob Wood reported, “Cirrus Design is the most recent addition to the stellar group of companies now sponsoring the event. They join Cessna, Garmin, The Southern Ford Dealers, and others.” *** Sebring #4 appears bound for new records. Paid exhibit space available increased again in 2008. “We are up nearly 30% in spaces over 2007, and now nearly every one of those is booked,” said Wood. Most of the 47 companies and the 59 models that have achieved SLSA status can be found at Sebring making it the largest collection of LSA anywhere. 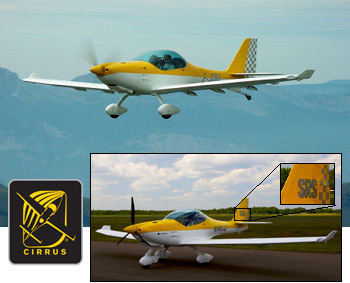 The new Cirrus trainer-to-be, labeled the SRS, is based on FK Lightplane's Fk14 Polaris. While I expect to fly the new model when ready, you can read my earlier pilot report on this handsome German aircraft. Cirrus plans to stick with the efficient Rotax 912 powerplant and tricycle gear. EAA AirVenture is full of surprises. We all knew about Cessna's confirmed LSA entry (though we had to travel to Oshkosh to see its new Skycatcher). Plenty of other surprises are expected. But one that caught almost everybody unawares was the Cirrus Design entry to aviation's newest segment. *** They'll import -- and modify, or "Cirrus-ize" -- FK Lightplane's gorgeous Fk14 Polaris. 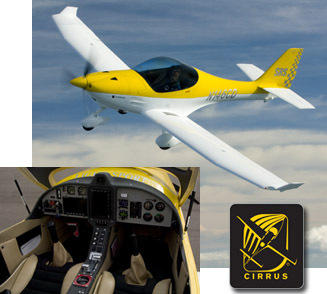 Cirrus cofounder Dale Klapmeier said, "The Polaris is the basis for a Cirrus LSA, which we'll call the SRS...for Sport." The successful Duluth builder wanted a low-wing composite to revise into a low-cost trainer in which new pilots can begin moving toward later ownership of a SR20/22 or the Cirrus Jet. *** "We want a fun, exciting LSA that's also a good trainer," added Dale. "We want to appeal all those young at heart potential aviators, including kids. Aviation needs to attract more pilots." Cirrus previewed their new SRS at their company display right at the entrance to Oshkosh on opening-day Monday. I add my welcome to this innovative company and hope to fly the SRS as soon as it's ready. EAA AirVenture is full of surprises. We all knew about Cessna’s confirmed LSA entry (though we had to travel to Oshkosh to see its new Skycatcher). Plenty of other surprises are expected. But one that caught almost everybody unawares was the Cirrus Design entry to aviation’s newest segment. 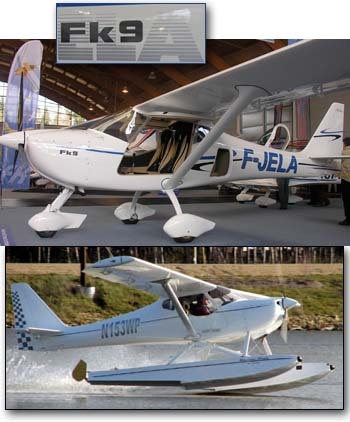 *** They’ll import — and modify, or “Cirrus-ize” — FK Lightplane‘s gorgeous Fk14 Polaris. Cirrus cofounder Dale Klapmeier said, “The Polaris is the basis for a Cirrus LSA, which we’ll call the SRS…for Sport.” The successful Duluth builder wanted a low-wing composite to revise into a low-cost trainer in which new pilots can begin moving toward later ownership of a SR20/22 or the Cirrus Jet. *** “We want a fun, exciting LSA that’s also a good trainer,” added Dale. “We want to appeal all those young at heart potential aviators, including kids. Aviation needs to attract more pilots.” Cirrus previewed their new SRS at their company display right at the entrance to Oshkosh on opening-day Monday.